Quickly rub the butter in with the flour until the mixture resembles crumbs. Mix the sugar and lemon zest into the mixture, then add the egg yolks and eggs work everything together and rest for 1 hour. Mix sugar with eggs, add rest of ingredients. Blind bake tarts bases at 150°c for 30 minutes. Make sure pastry is cooked. Fill tarts with filling and cook at 100°c for 45 minutes. Add juice to egg mixture. Add butter and stir over a double boiler to thicken. Once thickened, pass through a fine sieve and store in a piping bag. Whisk egg, caster sugar and lemon juice over a bain marie to a sabayon. Remove from the heat and mix in the butter till smooth and shiny. Toast the hazelnuts till golden brown then group them together on greaseproof paper on a heat proof tray. Slack the sugar with a little water in a thick bottomed pan. Heat to a dark caramel and pour over the hazelnuts to set them in the caramel. Once cold and set, pulse in a food processor to form crumbs. 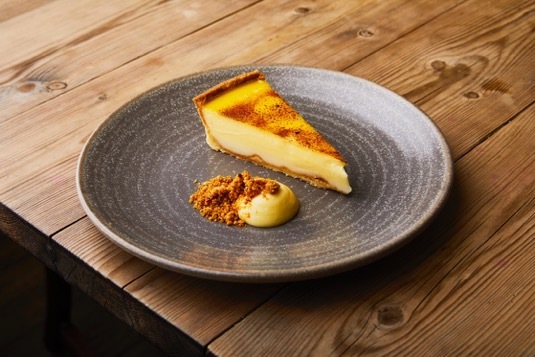 Serve the tart in the center of a large plate with a drizzle of lemon curd sauce and a scattering of praline crumbs. View the video recap here.